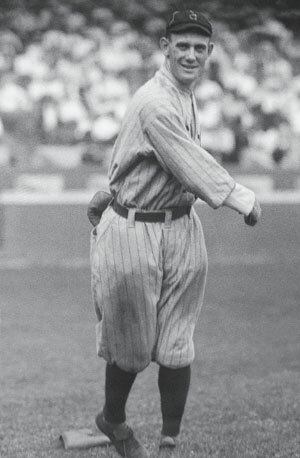 In a game against the Yankees on 16 August 1920, Cleveland infielder Ray Chapman was hit in the head by a pitch thrown by Carl Mays. Though, according to some accounts, the pitch barely missed the strike zone, Chapman had been crowding the plate against the submarine huler. Carl Mays was also well-known as a headhunter when it came to hitters who crowded the plate, and few doubted that the inside pitch was accidental (not that Mays intended to kill, of course). After being struck by the pitch, Chapman was taken from the Polo Grounds to the hospital, where Dr. T. M. Merrigan performed surgery. He never regained consciousness, however, and Chapman died twelve hours later, at 4:40 a.m. on 17 August. It is the only case in Major League history in which a ballplayer died as a direct result of being hit by a pitch. The extreme rarity of fatal or even of serious accidents in baseball is surprising, when one remembers the vast multitudes who play the game. Consider the number who are drowned while bathing or boating, who meet injury or death while hunting. In the light of such comparisons baseball is singularly free from untoward happenings. Ray Chapman’s fate, sad as it is, may be rated as sheer accident. It represents a coincidence not likely to occur again. Nevertheless, the incident resulted in some rule changes in Major League Baseball. The following season, the league established a rule that required umpires to replace the baseball anytime it got dirty (prior to this, pitchers made a point to dirty them up as much as possibly, in order to make them more difficult for a batter to see). The banning of the spitball after the 1920 season was also due in part to Chapman’s death. Interestingly, however, it would be another thirty years before batting helmets would be invented. Gorman, Bob. “‘I Guess I Forgot to Duck’: On-Field Player Fatalities in the Minor Leagues.” Nine 11.2 (Spring 2003).